The Soviet Union (Советский Союз, in Russian, also known in English as the USSR) was a country which existed in eastern Europe and northern Asia between 1922 and 1991. It shared borders with Poland, Czechoslovakia (now Slovakia, Finland, Turkey, Norway, Hungary, Romania, Iran, Mongolia, North Korea, Afghanistan and China. The capital city was Moscow. Other big cities in the USSR were St. Petersburg, Kiev and Minsk. The USSR was not a part of the European Union but since the country split up Estonia, Latvia and Lithuania have become EU members. The USSR's currency was called the Soviet Ruble. The USSR consisted of the following present-day countries: Russia, Georgia, Ukraine, Moldova, Belarus, Armenia, Azerbaijan, Kazakhstan, Uzbekistan, Turkmenistan, Kyrgyzstan, Tajikistan. The USSR also occupied the Baltic states of Estonia, Latvia and Lithuania between World War II and the break up of the Soviet Union but most countries considered the occupation to be illegal. The 1917 October Revolution overthrew the provisional Russian government and the tsar monarchy and revolutionaries led by the Bolshevik leader Vladimir Lenin took control. Between the mid-1920s and early-1950s the leader was Josef Stalin who was responsible for hundreds of thousands of deaths by starving in Ukraine and the murder and exile of large numbers of the population who were against him. During World War II the USSR was allied with the United Kingdom and France (and later the United States). The USSR was invaded by Germany resulting in huge numbers of deaths - possibly 20 million Soviet people were killed during World War II - more than in any other conflict ever. The Soviet Union was the world's biggest country. Today, Russia remains the biggest country in the world. The Soviet Union spread from central Europe to the far east of Asia. West to east was over 10,000 kilometres and the country contained 11 time zones. The USSR's highest mountain, at 7,496 metres, was Communism Peak (now known as Ismail Samani Peak, in Tajikistan). 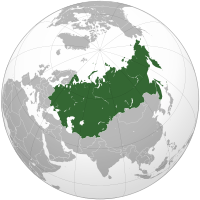 In 1991 there were 294,000,000 people in the USSR, 51% of whom were ethnic Russians who speak the Russian language, the official language if the country. Other common languages included Ukrainian, Georgian, Kazakh, Armenian and Azerbaijani. The USSR was officially an Atheist country but many people continued to practice their Christian (mostly Russian Orthodox) and Muslim faiths. There were many UNESCO World Heritage Sites in the USSR: Red Square and the Kremlin in Moscow, L'viv in Ukraine and many others. 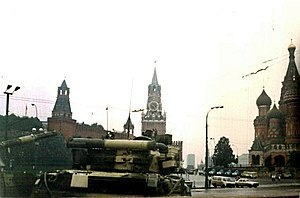 Because of the Cold War few tourists visited the Soviet Union until the end of communism. This page was last edited on 4 April 2019, at 19:17.